I often use sketches to begin the design process of my scrapbook pages, and this is one I particularly like. In fact, I like it so much that I have made two pages using the same sketch. It is interesting to see just how differently the two pages have turned out, considering that the layout is pretty much the same. On this first page, I have done some watercolouring straight on to the Designer Series Paper. First, I stamped the images in Stazon and then watercoloured using a blender pen, just using a small amount of ink and as little blending as possible to make sure that paper wasn’t damaged by the watercolouring process. Stamp Sets: Lovely as a Tree, Eastern Influences. Cardstock: Old Olive, Good Morning Sunshine Designer Series Paper, Baja Breeze Carousel Note. Inks: Black Stazon, Kiwi Kiss, Basic Brown, Baja Breeze, Riding Hood Red. Accessories: Blender Pens, Scallop Edge Punch. Images copyright 1990 -2009 Stampin’ Up! This second page uses one of the Stampin Around Wheels, which I have rolled across the patterned paper before adding the photos. I then stamped the small trees using the rock and roll technique, and two step stamping, onto Confetti White cardstock and cut them out. 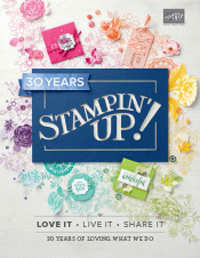 Stamp Sets: Trendy Trees, Funky Forest Wheel. Cardstock: Old Olive, Chocolate Chip, Confetti White, Good Morning Sunshine Designer Series Papers, Kiwi Kiss Carousel Note. Inks: Old Olive, Chocolate Chip, Summer Sun, Pumpkin Pie, Ruby Red. 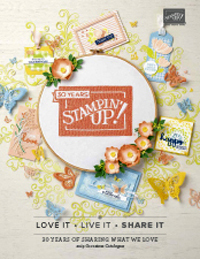 Accessories: Stampin Around Wheel, Handle and cartridge, sponge daubers, piercing tool and mat pack, white gel pen, scallop edge punch, paper snips, rub ons (retired). Hey Chris. I love both pages. I am not a s’booker but appreciate all the talent that goes into making such beautiful works of art. U r v v right….a tweak here and a stamp there can alter the look of something even if the base is the same. Awesome. Love how you used Trendy Trees.